Coffee Oasis is a coffee shop/organization located in Washington State that provides help for our youth including programs for drug abuse, homelessness, violence and poverty. Greetings friends and fellow crafters, this is a long one so please be patient. I am so excited to be taking part in this blog hop as it is for an awesome cause!!! To make this I used Kat's Snowman Die as well as Snowman Kisses Sentiment. I used Ebony Black Nuvo drops on his eyes and buttons, and Ripened Pumpkin Nuvo Drops on his nose. The Mouth is made of the centers from the Snowflakes. I used original Distress ink in Tumbled Glass on the edges of my snowman to add some color. The Paper collection used for the background and scarf is Bo Bunny Christmas Collage from 2014 that was in my stash. MEGA Sponsors Please keep in mind that the following sponsors have agreed to donate a portion of their sales during this hop to the Coffee Oasis so please visit them and remember that if you place an order, you will be donating and supporting Coffee Oasis as well! These sponsors are also providing prizes to the hoppers as well! Kat Scrappiness is offering 15% off EVERYTHING IN THE STORE and is donating 15% of all sales during this blog hop to Coffee Oasis! Use coupon code: COFFEEOASIS to save! We are also giving away gift packages! Your card is so pretty, I love snowman cards. Thanks for sharing. LeeAnn I love your sweet as can be snowman!! He looks so happy to be in a snow storm! Great card! Fun card, snowman is so adorable! Such a fun winter card! That snowman looks so happy! What a great snowman! Super cute! snowmen are always a winner! Adorable snowman and I love the snowy scene. Very cute! Thank you for sharing! Love the way you use Nuvo for the carrot nose & eyes & bottom...and the snowflake smile just tops it off!!! A snowman screams winter and fun. Thanks for sharing your adorable snowman. awww! the snowman is so cute! That snowman is so adorable. Great card. Cuteness! Great job on the snow background! Great card, I love that snowman! Very Christmasy and festive!! Love the snowman!! The background is great!! What a cute card and so fun. And you are right! This is a great cause. Adorable card!! makes me wanna sing the song from Frozen....do you wanna build a snowman?? I don't have this snowman die yet, but it is totally adorable! Great card! What a wonderful snowman and your scene is fantastic! 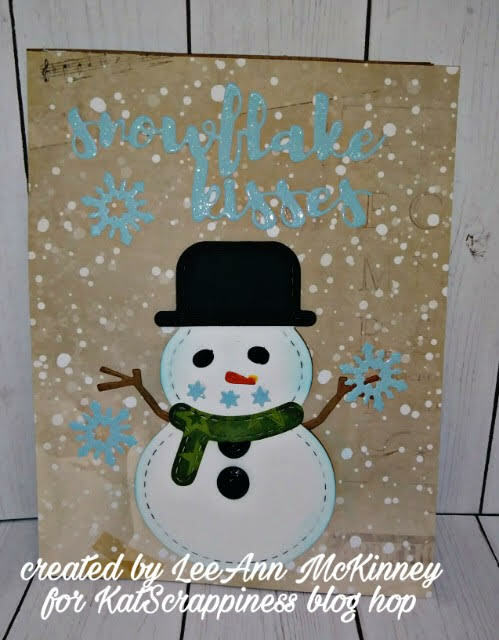 LeeAnn love the snowman and the layout of your card! The snowman is so sweet and adorable!! This little cutie is perfect for this holiday card. Thanks for sharing this inspiration with these fun products. thanks for sharing your amazing inspiration, I just love your card! New Year New You and White Rose Crafts!! !